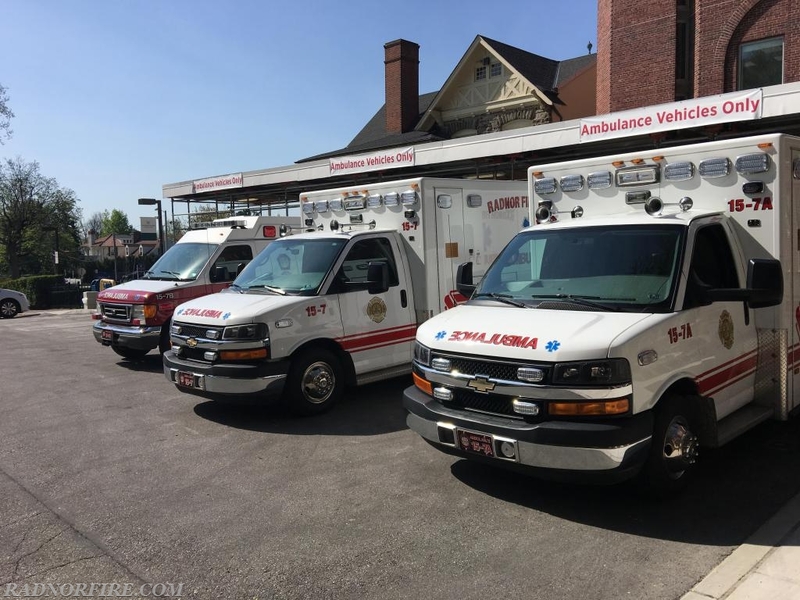 Radnor Fire Company's EMS crews were able to respond to multiple, concurrent calls Thursday morning on a busy, hot morning across the township. MICU 15, MICU 15A and Ambulance 15B were all deployed at the same time on calls that resulted in the units all arriving at Bryn Mawr Hospital around the same time (pictured). Radnor's MICU (medical intensive care unit) crews covered a cardiac arrest call that resulted in ROSC (return of spontaneous circulation). Radnor's BLS (basic life support) unit was on a call for a patient who fell and did not have life-threatening injuries. The BLS unit was assisted on scene by Engine 15 and her crew.